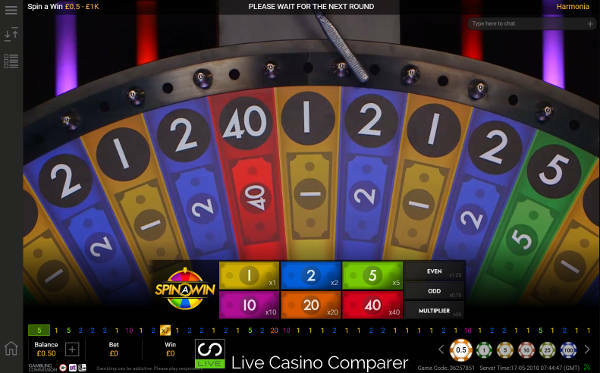 Playtech Live Spin A Win Review - Watch me play and tell you how it is. 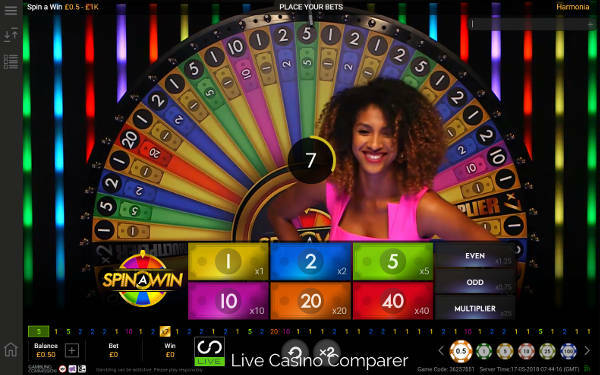 Following it’s withdrawal in February 2018 a few weeks after launch, Playtech Live Spin A Win has been re-released with a new wheel and is now truly live. It’s Playtech’s first foray into the world of Wheel of Fortunes and they’ve done a pretty good job. Playtech has added a range of additional side bets that you just don’t see on other games of this type. Watch my Spin A Win Video on the left. What is Live Spin A Win? Playtech Live Spin A Win is a presenter led game that involves a big wheel. You know the sort, the Wheel of Fortunes type wheels you see by the cashiers desks in land based casinos. I guess they are more popular in Las Vegas, as I don’t recall seeing any in the London casinos I go to. Anyway, I digress. The Presenter spins the wheel, your job is to bet on the number where you think the wheel will stop. It’s a simple game, loved by many and despised by a few. I’m sitting on the fence with Playtech Live Spin A win. It’s not my sort of game, but I can see how it’s fun to play. The wheel is separated into 53 different segments. 6 numbers – 1, 2, 5, 10, 20 & 40 + 2 Multiplier symbols 2x and 7x are spread throughout the 53 spaces. Number 1 appears 23 times and pays Even Money. Number 2 appears 15 times and pays 2:1. Number 5 appears 7 times and pays 5:1. Number 10 appears 3 times and pays 10:1. Number 20 appears twice and pays 20:1. Number 40 appears one and pays 40-1. There are 30 Odd numbers and 21 even Numbers. The multipliers of 2x and 7x take up 2 sections. When these are hit, your initial bet is left live for the next spin. All number payouts are multiplied by the multiplier, so if the 7x multiplier landed, the next spin would pay 14-1 if a 2 was the result orr 280-1 if 40 comes in. It’s possible to have multiple multipliers come in and when this happens the payouts can be huge. You can bet on the main game, on a selection or all of the 6 Numbers. Or you can place a wager on just the Side Bet area, where you can bet on the wheel stopping on an Odd number, an Even Number or one of the Multipliers. The payouts are 0.75 for an Odd number, 1.25 for the even number and 25:1 for a multiplier. Or you can place a bet on the main game with a side bet. Note:- When playing the Side bets, an active multiplier doesn’t apply to the payout structure, this only applies to the Main wheel bets. The RTP ranges from 90.67% up to 97.22% for all aspects of the game. The 97.22% is achieved on the Odds Side bet, which if you remember has 30 numbers on the wheel and pays 0.75:1. This is close to the 97.3% RTP you get on the odd/even bets playing European Roulette. 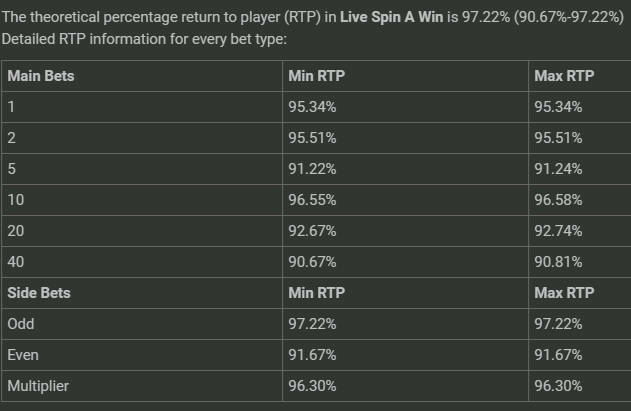 As RTP’s go apart from the odd bet you’d get better value playing other table games or slots. If you’re after the big Win then slots is a better alternative. Betting time is about 18 seconds, which is plenty of time to place up to the maximum of 9 individual bets. A repeat bet function makes it even easier to place bets on subsequent spins. The Spin A Win playing or user interface has everything you’d expect. It’s simple an unassuming and certainly doesn’t detract from the main game. The betting table reduces in size once betting time is over. Sound and Vision controls are really easy to get to. The default setting for Video is high with control handled automatically. If your connection is bad, the full screen mode switches to a smaller inset video, which is just as playable as full screen. You definitely need to know how to adjust the sound, as the presenters can’t half talk and loudly at that! What do I think of Playtech Live Spin A Win? The Side Bets in this game make it unique. The quality of the presenters so far has been very good. A good or bad presenter can make or break this game, and quite honestly its the presenter that would keep me coming back, not the game. I’m old school and prefer to play Live Blackjack. The studio presentation looks nice but it’s a bit dark for my liking, I guess part of that is because it’s new. 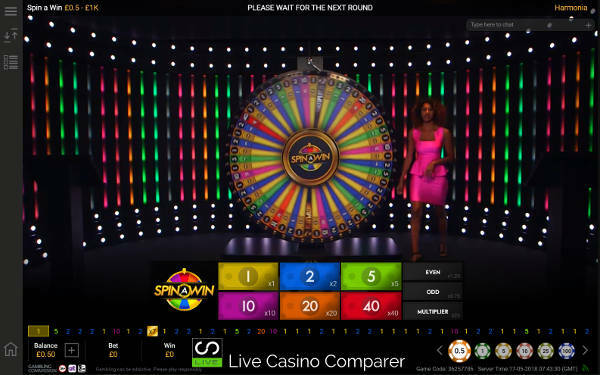 Spin A Win can be played at all Playtech Live Casinos. Betfair VIP Roulette To see the latest Live Casino promotions. Click Here. Bet365 Premium Roulette No Live Casino Bonus Click Here. Paddy Power VIP Roulette To see the latest Live Casino promotions. Click Here. Spin A Win 0.10 – 5k None No Live Casino Bonus. If you like these types of games I can recommend a great alternative. Monopoly Live Dream Catcher has a very different playing strategy from other wheels of fortune games. It’s one of the most fun alternatives I can find.